This article is about the Martha and the Vandellas song. For other songs with the same title, see Nowhere to Run (disambiguation). 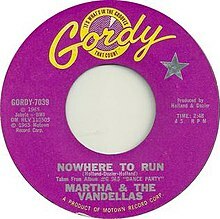 (1965) "You've Been in Love Too Long"
"Nowhere to Run" is a 1965 pop single by Martha and the Vandellas for the Gordy (Motown) label and is one of the group's signature songs. The song, written and produced by Motown's main production team of Holland–Dozier–Holland, depicts the story of a woman trapped in a bad relationship with a man she cannot help but love. Holland-Dozier-Holland and the Funk Brothers band gave the song a large, hard-driving instrumentation sound similar to the sound of prior "Dancing in the Street" with snow chains used as percussion alongside the tambourine and drums. Included on their third album, Dance Party, "Nowhere to Run" hit number eight on the Billboard Pop Singles chart, and number five on the Billboard R&B Singles chart. It also charted in the UK peaking at number twenty-six on the chart. The single release was backed with "Motoring". This version was ranked #358 on Rolling Stone's list of The 500 Greatest Songs of All Time. This song is featured in the film Bringing Out the Dead. Arnold McCuller made a version of the song for the soundtrack of the movie The Warriors from 1979. The original could not be used for the action picture. It was later utilized again for the video game adaptation in 2005. In July 1988, following the success of the film 'Good Morning Vietnam' the song was re-released in the UK by A&M Records, with James Brown's 'I Got You (I Feel Good)' on the flip side.The single spent three weeks on the UK chart reaching its highest position of number 52 by 24 July 1988. The alternative history video game Wolfenstein: The New Order, features an English/German version of the song by the fictitious all female group Die Partei Damen. The song was remixed by Boga in 2015 and was featured in the official trailer of the film Baby Driver. ^ "Bringing Out the Dead (1999) - Soundtracks". IMDb.com. Retrieved March 29, 2019. ^ "Cotgrave Road Footpath Campaign". Retrieved April 20, 2019. ^ "WOLFENSTEIN: THE NEW ORDER - NOWHERE TO RUN TRAILER". IGN. April 8, 2014. Retrieved October 7, 2016. ^ "Nowhere To Run - Single by Boga". iTunes. January 12, 2015. Retrieved August 8, 2017. ^ "BABY DRIVER - Official Trailer (HD)". YouTube. March 29, 2017. Retrieved August 8, 2017.